If you’ve noticed you have red, swollen gums that bleed when you brush your teeth, it could be a sign that you have periodontal disease, a primary cause of tooth loss for adults. Also known as gum disease, when left untreated this infection of your gums can cause major damage to your jaw bone and soft tissue. Caused by the same bacteria that produce tooth decay, early stage gum disease is usually painless, and many people are unaware they have it. But because periodontal disease can be reversed with good oral hygiene and early treatment, we strongly recommend you visit Apple Dental twice a year, so that we can examine the health of your teeth and mouth, and check for early symptoms of gum disease. To treat and reverse periodontal disease, start by ensuring your oral health is the best it can be by following a healthy, balanced diet, brushing your teeth day and night with a fluoride toothpaste, and flossing once a day. We may also recommend the use of an antiseptic mouthwash to help prevent plaque formation. To remove built up tartar from above and below your gum line, the Apple Dental team may use a deep-cleaning method called scaling and root planing. If your gum disease has developed into the more serious periodontitis, we may prescribe a more extensive program of scaling under local anaesthetic, to ensure plaque and tartar are fully removed from the periodontal pockets. By monitoring these pockets over time, we can monitor your treatment and ensure the periodontitis isn’t progressing. With treatment and advice from Apple Dental, in most cases gum disease can be treated, and your mouth restored to its total optimum health to help you retain your teeth for life. Periodontal disease, or gum disease, occurs when plaque builds up on your teeth and gums. The bacteria in this plaque then create irritation and infection in your gums, which is known as periodontal disease. If left untreated, over time gum disease will destroy your teeth and bone, causing tooth loss and other problems. What other health problems are linked to periodontal disease? Gum disease is the number one cause of tooth loss for Australian adults. Clinical studies have also shown that people with gum disease could have a higher risk of developing diabetes and heart disease. A further link is that people with poor oral hygiene, smokers, those with diabetes, and pregnant women, may have a higher risk of developing gum disease. Receding gums, or teeth which appear longer over time. Remember, with early treatment, the effects of gum disease can be treated. If you experience any of these symptoms, make an appointment with Apple Dental for a comprehensive examination and treatment advice. As periodontal disease becomes more severe, the more difficult it becomes to treat. 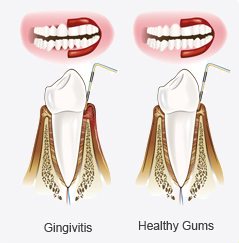 But in many cases we can slow or halt the progression of gum disease with early treatment. For this reason, we strongly recommend you visit Apple Dental regularly, so that we can look for any developing problems. Visit Apple Dental regularly for a comprehensive search for any gum infection symptoms, including x-rays to help us diagnose any deep gum problems. Use an excellent brushing and flossing routine at home to ensure the very best oral hygiene – the most important factor in preventing gum disease. 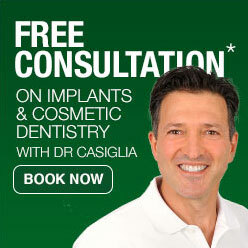 Have scaling and root planing from a specialist Periodontist for more advanced cases. This treatment involves scraping off the built up calculus from above and below your gum line, and removing any rough spots on your tooth root (where bacteria live) using root planing.